The iron frame has to be tightly fastened to the back to support the tension of the strings. It's construction follows the direction of the pull and is elegantly reinforced where ever necessary. 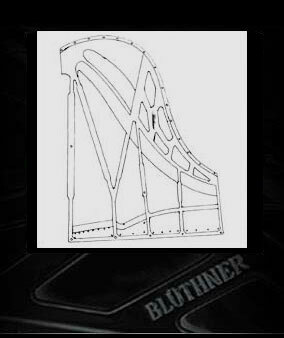 Not only the appearance is important the frame also influences the acoustical facilities of the instrument .Long experience has taught the engineers of Blüthner how to enhance these qualities by following specific construction principles. The surface of the frame is treated with great care .But also the engineering demands close attention. 500 holes have to be drilled into various places with great precision that needs constant checking to guaranty a perfect and lasting performance.